While most people agree that having a mentor is a good thing, they don’t know how to find one or use one. And despite widespread approval for the idea of being a mentor, most people don’t think they have the time or skills to do so. Positive mentoring relationships can change the way we lead and help us succeed. 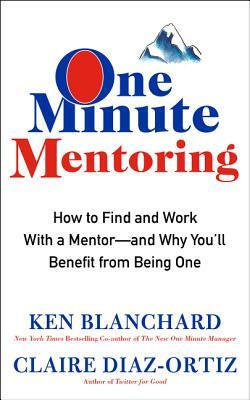 In One Minute Mentoring, legendary management guru Ken Blanchard and Claire Diaz-Ortiz, a former Twitter executive and early employee, combine their knowledge to provide a systematic approach to intergenerational mentoring, giving readers great insight into the power and influence of mentoring and encouraging them to pursue their own mentoring relationships. Using his classic parable format, Blanchard explains why developing effective communication and relationships across generations can be a tremendous opportunity for companies and individuals alike. One Minute Mentoring is the go-to source for learning why mentoring is the secret ingredient to professional and personal success. Ken Blanchard, PhD, is one of the most influential leadership experts in the world. He has co-authored 60 books, including Raving Fans and Gung Ho! (with Sheldon Bowles). His groundbreaking works have been translated into over 40 languages and their combined sales total more than 21 million copies. In 2005 he was inducted into Amazon's Hall of Fame as one of the top 25 bestselling authors of all time. The recipient of numerous leadership awards and honors, he is cofounder with his wife, Margie, of The Ken Blanchard Companies®, a leading international training and consulting firm. CLAIRE DIAZ-ORTIZ is an author, speaker, and technology innovator who has been named one of the 100 Most Creative People in Business by Fast Company. She was an early employee at Twitter, where she spent five and a half years, and is the author of seven books, including Twitter for Good: Change the World One Tweet at a Time and Design Your Day: Be More Productive, Set Better Goals, and Live Life on Purpose. She writes a popular business blog at ClaireDiazOrtiz.com, and is the cofounder of Hope Runs, a nonprofit organization operating in AIDS orphanages in Kenya.